Whichever hairstyle you prefer, a hair accessory can really complete your look or give it a nice personal twist. 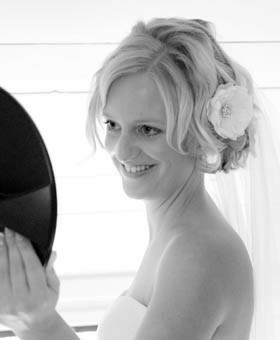 When you book a trial session with me, you can try out all sorts of wedding hair accessories to your heart’s content. I buy these from different national and international designers and suppliers, so you can choose from a very exclusive and wide selection. 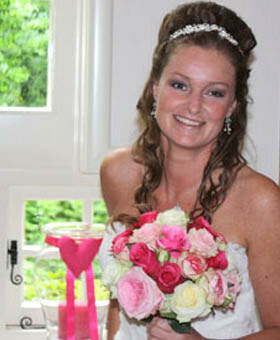 Everything is possible: from a beautiful handmade hairgrip or flower, to a sparkling tiara or birdcage veil. Have a look at www.fashionhairaccessories.nl for the complete collection of exclusive festive and bridal hair accessories. Totally hot and vintage is the birdcage veil. It is a short veil, attached to a small hat or headband, which (partly) covers your face and draws the attention to the contours of your face. It was especially popular in the 40’s and 50’s. Nowadays they are available in all sorts of colours and shapes; with applications, feathers or flowers for instance. The birdcage veil can be worn with any hairstyle and is particularly stunning with modern and vintage-style wedding dresses without too many details. Of course I would be happy to advise you whether a birdcage veil would be suitable for you. The name might be a little unfamiliar, but you have probably seen them before. Fascinators are head bands with a bold, playful decoration fixed to it; a collection of feathers for example or a small hat. They take over the role of the more traditional hat. They can also be a very nice and trendy hair accessory for your wedding guests and brides maids. 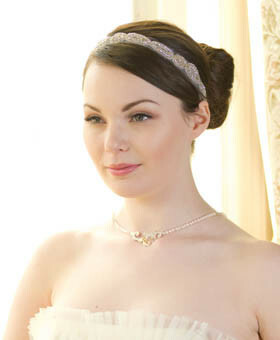 With an alice band or head band you can achieve both subtle and more striking effects in your hair. They come in all sorts of varieties: with small or big flowers, coloured feathers or a-symmetrical applications with glistening crystals and beads for example. Vintage, trendy, exotic or super romantic wedding look? Whichever look you have in mind, hairflowers allow you to do it all as they come in a large variety of shapes, sizes and colours. Hairflowers can be used as clips or can be fixed around a pony tail or bun with a hairband. Applying a hair comb to a hair updo is quick and easy. They are available in a variety of colours, sizes and shapes. For example with pearls, feathers, rhinestone crystals and beads. You will always find a hair comb that perfectly suits your hairstyle and dress. Hairgrips and jaw clips create eye-catching effects in your hair. Which effect? It is totally up to you, as grips and clips are available in many different styles. Glamourous, romantic, classic, vintage, modern and many more. Going for an updo with a subtle effect? Then hair pins and curlies are the perfect addition. These small accessories can be easily pinned or twisted into your hair. For a romantic effect, choose curlies or hairpins with small pearls for example. Prefer some glamour? Try them with some sparkling rhinestone crystals. 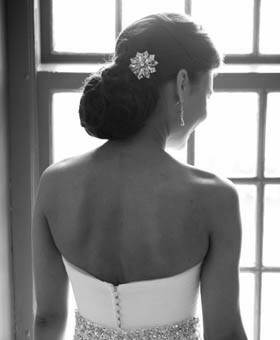 If you want to add a good amount of glamour to your wedding hairstyle, try a pretty tiara. Applied with sparkling rhinestone crystals, pearls or crystals, a tiara really looks beautiful with a more classical dress. They can also be used perfectly in combination with a veil. This does require some skill and advice from a trained hairstylist to make sure it’s applied and fixed well. Also around a bun or an updo, a tiara comb looks beautiful. 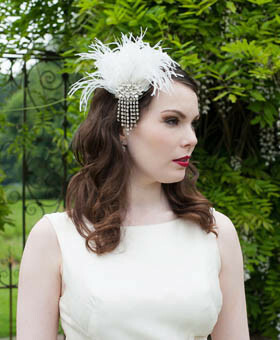 The ideal accessory for the perfect finish of your wedding dress! A handmade satin sash shows of your curves and waist beautifully. A great eye catcher for any bride!